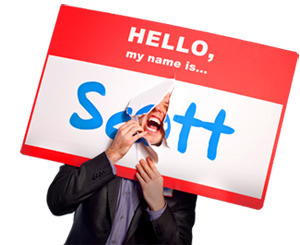 Lessons Learned from a Job That Sucked - HELLO, my name is Scott! My first job out of college was at a discount furniture warehouse. I hated it. Every day was a perfect combination of boredom, back pain and complaints from frustrated customers. The store was hot in the summer and cold in the winter. Most of my coworkers with were twice my age and my boss was a grumpy old jerk. Fortunately, the pay sucked and there were no benefits. Nevertheless, I needed money and I needed experience. Fast. So, I sucked it up and did the best I could. First thing I learned. My boss said it was the key to retail sales. And since he’d been in the business since roughly the 1850’s, I figured he was right. And I think it applies to retail, general sales and networking too. After all, people do business with their friends. How long does it take you to turn a stranger into a friend? Are you like everyone else you work with? I’ve been a customer before. I know what it’s like. So, one afternoon on a slow day, I sat down and made a list of every possible feeling, emotion and assumption made by customers walking through the store. For example: ‘God I hope the salesman doesn’t talk to me…’ and ‘I just want to browse, go away!’ By predicting their behaviors, I was able to disarm their concerns. Instead of approaching them, I enabled them to approach me with my sense of attraction. What are your customers thinking about when they walk through the door? I don’t know why, but by carrying a bottle of Diet Dr. Pepper wherever I went, customers seemed to feel more comfortable. The soda made me appear friendly, approachable, casual and not goal oriented. As if I was saying, ‘Yep, I’m just hanging out, drinkin’ a pop. If you need anything, I’ll be around.’ Interesting, huh? What object could help you appear more approachable? I wasn’t on commission. So, I told customers that right away. Most of the time it made them feel comfortable, less intimidated and more willing to work with me. This strategy helped me become an atypical salesman because most of my coworkers refused to work with customers who only bought small items. They just wanted the fat commission from the bedroom set. I, on the other hand, treated all customers equally. I just didn’t care. Interestingly, the customers who bought small items from me loved working together so much, that they often returned six months later with their kids to buy the bedroom set. And who do you think they wanted them to sell it to them? Damn right. What truths do you tell the customers right away? During my first few weeks, I walked around the store and made flashcards of every piece of furniture we sold. The cards included descriptions, prices and the like. Over time I was able to speed up my learning curve and memorize every item we offered to better help the customers. I’d even quiz myself on the various products when we were slow. Hell, there was nothing else to do. As one of the few young salesmen in the store, I was always assigned the task of moving various couches, loveseats and tables. (Damn it!) 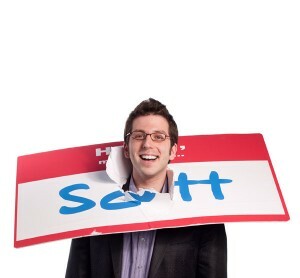 But, although it was tough on my back, I used the moving process as a sales tool. For example, if I were sliding a couch into a corner, I’d ask customers walking by, ‘So, does this look good with that maple table?’ or ‘Could you help me slide this chair around the couch please?’ They were almost always happy to help. We’d often end up talking about the decorating process, sore muscles and the like. Instant friends! Also, in many instances, instant sales. How do you get your customers involved? • Lots of kids came into the store. Instead of trying to sell the parents, I sold the kids. I sold them on ME. This included offering them free donuts or taking 50% off or HOT DEAL stickers and putting them on their shirts. They loved it! The kids AND the parents. • Because we offered donuts on the weekend, I’d always look for customers who were eating them. Then I’d offer such lines as, ‘Are you all hopped up on sugar yet?’ and ‘If you spill jelly on this couch, you gotta buy it!’ They loved it. Good times.